Headhunting is the practice of taking a person's head after killing him or her, usually for some ritual purpose and with some kind of public or semi-public display. Headhunting was practiced during the pre-colonial era in parts of China, India, Afghanistan, Nigeria, Myanmar, Borneo, Indonesia, the Philippines, Taiwan, Japan, Micronesia, Melanesia, New Zealand, and the Amazon Basin, as well as among certain tribes of the Celts and Scythians of ancient Europe, and in the Pacific theater of World War II. Today it is a universally prohibited practice and appears to have died out. The practice seems to have been universally conducted by men warriors for a variety of reasons, including proving manhood, contributing to a larger public display of institutional power, and collecting a souvenir of battle. Many of the religiously oriented headhunters, were motivated by the belief that removing and in some cases shrinking the head of a slain enemy would allow the victor to control the enemy's spirit and benefit from his power. References to taking heads and displaying them appear in the Bible and in accounts from Medieval Europe. The apparent disappearance of the practice represents an incremental advance of humanity toward greater recognition of the oneness of all people. As a practice, headhunting has been the subject of intense discussion within the anthropological community as to its possible social roles, functions, and motivations. Contemporary scholars generally agree that its primary function was ceremonial, and that it was part of the process of structuring, reinforcing, and defending hierarchical relationships between communities and individuals. Some experts theorize that the practice stemmed from the belief that the head contained "soul matter" or life force, which could be harnessed through its capture. Themes that arise in anthropological writings about headhunting include mortification of the rival, ritual violence, cosmological balance, the display of manhood, cannibalism, and prestige. Several tribes of the Jivaroan group, including the Shuar in Eastern Ecuador and Northern Peru, along the rivers Chinchipe, Bobonaza, Morona, Upano, and Pastaza, main tributaries of the Amazon, practiced headhunting for trophies. The heads were shrunk, and were known locally as Tzantzas. The people believed that the head housed the soul of the person killed. 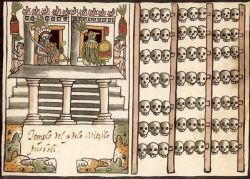 A tzompantli is illustrated to the right of a depiction of an Aztec temple dedicated to the deity Huitzilopochtli; from Juan de Tovar's 1587 manuscript, also known as the Ramírez Codex. A tzompantli is a type of wooden rack or palisade documented in several Mesoamerican civilizations. It was used for the public display of human skulls, typically those of war captives or other sacrificial victims. A tzompantli-type structure has been excavated at the La Coyotera, Oaxaca, site. It is dated to the Proto-Classic Zapotec civilization, which flourished from around the second century B.C.E. to the third century CE. Tzompantli are also noted in other Mesoamerican pre-Columbian cultures, such as the Toltec and Mixtec. Other examples are indicated from Maya civilization sites. A particularly fine and intact inscription example survives at the extensive Chichen Itza site. Head tray, Papua New Guinea, early 1900s (Field Museum of Natural History). The artifact itself is a two-head tray and the photograph behind it depicts a seven-head tray. The display would have been hung on the wall of a communal men's house. Headhunting was practiced in many parts of Southeast Asia. Anthropological writings exist on the Ilongot, Iban, Dayak, Berawan, Wana, Mappurondo, and other tribes. Among these groups, headhunting was usually a ritual activity rather than an act of war or feuding and involved the taking of a single head. Studies in Sumba, Indonesia by Janet Hoskins, showed that the rationale for the headhunting ritual could vary even on one small island. In East Sumba, headhunting was largely to show territorial conquest. In West Sumba, it was an act of vengeance between equals. In many parts of Southeast Asia, the practice seems primarily for fertility rituals. Headhunting has been usually a ritual activity rather than an act of war or feuding, and involved the taking of a single head from another village. The spirit of the victim could be enlisted in one's own army of friends in the "skyworld." Headhunting also acted as a catalyst for the cessation of personal and collective mourning for the community's dead. Ideas of manhood were wrapped up in the practice and the taken heads were prized. Around the 1930s, headhunting was suppressed among the Taiwanese aborigines during the Japanese occupation of Taiwan and among the Ilongot in the Philippines by the U.S. authorities. 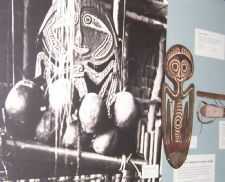 In Sarawak, on the island of Borneo, the colonial dynasty of James Brooke and his descendants eradicated headhunting in the hundred years before World War II. In 1968, Michelle Rosaldo and her husband Renato, while doing fieldwork in the Philippines, found that 65 of 70 adult Ilongot men of the northern Philippines over the age of 20 years had taken at least one head. This was a surprising finding, as the people seemed to "fit in" with more modern ideas of culture and seemed fairly peaceful. They did not report any previous reasons of earlier Southeast Asian tribes. They did not bring the heads back and display them, either. They said they took heads when they had a "heavy heart" or felt angry. In 1974 Rosaldo returned to study more about the reasons they took heads. She found they felt that men were more passionate than women, yet had less recourse to verbal and other means of expressing this passion. They felt that the spirit of the victim was actually with them and helping them mature and grow to find better expressions for their emotion. They felt that they were able to get prestige from the group and attract wives through their headhunting. Kenneth George (1996) wrote about annual headhunting rituals that he observed among the Mappurondo religious minority, an upland tribe in the south-west part of the Indonesian island of Sulawesi. Actual heads are not taken; instead, surrogate heads are used, in the form of coconuts. The ritual, called Pangngae, takes place at the conclusion of the rice harvesting season. It functions to bring an end to communal mourning for the deceased of the past year, express inter-cultural tensions and polemics, allow men to display manhood, distribute communal resources, and resist outside pressures to abandon Mappurondo ways of life. In what is now known as New Zealand, the Māori would preserve the heads of enemies, removing the skull and smoking the head. Māori are currently attempting to reclaim the heads of their ancestors held in museums outside New Zealand. During the Spring and Autumn Period and Warring States Period, Qin soldiers collected their enemies' heads. Since most of the soldiers were slaves, they and their families could be freed from slavery and even secure promotions in the army by returning victorious with heads. The act of Qin soldiers carrying heads in battles usually terrified their foes. This is why headhunting is one of the factors in the Qin dynasty defeating six other nations and unifying China. Although many practices in Europe could certainly be called headhunting, usually they have not been referred to as such. Examples of such practices exist in the Bible, in Ancient Rome and Greece, and among Celtic and other northern European tribes. The future King David in the Bible is known for killing Goliath, but is less well known for his subsequent act of beheading the felled Goliath and displaying the head to all around in order to verify his victory and terrify the enemy. Romans and Greeks recorded their habits of nailing heads of personal enemies to walls, or dangling them from the necks of horses, and human skulls are found amongst votive offerings. The Apian Way in Rome was often lined with severed heads on stakes meant to terrify and preclude any thought of rebellion. The ceremonial display of heads was common throughout Europe in the Middle Ages as well, although it became less common toward the end of the thirteenth century. The Celts practiced headhunting for an indeterminate religious reason. Headhunting continued to be practiced after their conversion to Christianity by the demi-Celtic Gaels, although this was probably more traditional than religious. Heads were also taken among the Germanic tribes and Iberians, but the purpose is unknown. During World War II there were verified reports U.S. soldiers collected a souvenir head of a Japanese killed in the South Pacific battles. An authentic shrunken head is a human head that has been removed and prepared for display. In World War II shrunken heads of prisoners were also found in German concentration camps. Most notable findings were in the Buchenwald camp, where they were displayed in the camp center to terrify the prisoners. The manufacture of shrunken heads was formerly the specialty of a number of ethnic groups that practiced headhunting, most notably the Jívaro or Shuar people of Ecuador and Peru. 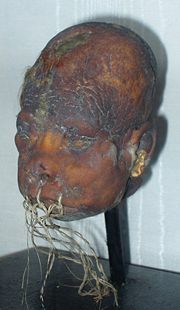 Among the Shuar, a shrunken head is known as a tsantsa. The taking of heads is no longer practiced, but the Shuar still produce replica heads, which they sell to tourists. The practice of making shrunken heads originally had religious significance; the heads were believed to harness the spirits of those enemies and compel them to serve the shrinker. The Shuar in Amazonian Ecuador and Peru practiced headhunting in order to make shrunken heads and use them for ritual purposes. Wakani - innate to humans thus surviving their death, later turning into vapor. Arutam - literally "vision" or "power," protects humans from a violent death and assures their survival. Muisak - vengeful spirit, which surfaces when an arutam spirit-carrying person is murdered. To block the last spirit from using its powers, and even turn them into their friends, they severed their enemies' heads and made them into shrunken forms. This also served as a warning to any surviving enemies or would be attackers. The shrinking process primarily involved the desiccation of the skin. The skull was removed from the head: the maker would make an incision on the back of the neck and proceeded to remove all the skin and flesh from the cranium. Next, they sewed the eyelids shut and held the mouth together with splinters. Fat from the flesh of the head was removed. The flesh was then boiled in water in which a number of herbs containing tannins were steeped, and then dried with hot rocks and sand, while being molded by the preparer to retain its human feature. The lips were sewn shut, and various decorative beads were added to the head. Shrunken heads are known for their mandibular prognathism, facial distortion and shrinkage of the lateral sides of the forehead; these are artifices of the shrinking process. The process to reduce the size of the heads was accompanied by a ritual, which culminated with la Fiesta de la Victoria (Spanish for "victory feast") celebrated by the entire community. Traditionally, about one head a year would be taken, and then only from another village. There was, however, much fear and violence within the tribe and the need to revenge any offense was taught to the very young. Christian missionaries sought to intervene in the process by teaching the people the concepts of grace and forgiveness, and they may well have had some positive effect in that regard. There were many other cultural interventions, however, that increased the incidence in headhunting. Colonialists were fascinated by the process, and they created an economic demand for shrunken heads. A stop was put to this when the Peruvian and Ecuadorian governments outlawed the traffic in heads. Replica shrunken heads are manufactured as curios for the tourist trade and can be bought in airport shops such as those in Quito, Ecuador. These are made from leather and animal hides carved to resemble the originals. The presence or absence of nasal hair is one clue as to whether a shrunken head is authentic or a replica. One of the largest collections of authentic shrunken heads is a display of seven heads in Seattle, Washington. It also includes the smallest shrunken head in the world, which is about the size of a tennis ball. Miller, Mary Ellen, and Karl A. Taube. 1993. The Gods and Symbols of Ancient Mexico and the Maya. Thames & Hudson. Ramirez, Roberto. 2017. Tower of human skulls in Mexico casts new light on Aztecs Reuters. Retrieved December 27, 2017. Rosaldo, Renato. 2000. Of Headhunters and Soldiers: Separating Cultural and Ethical Relativism Retrieved December 27, 2017. Russell, Susan. Head-Hunting in Southeast Asia Retrieved December 27, 2017. All links retrieved December 11, 2017. This page was last modified on 27 December 2017, at 17:31.